In mobile world, bigger is not always better. That can be the case for specs, and it can also be the case for market share: and a report out today from Juniper Research highlights a case in point for the latter: Samsung was the biggest smartphone maker in terms of global shipments in Q1 2012, but when it came to making money, Apple was still on top. 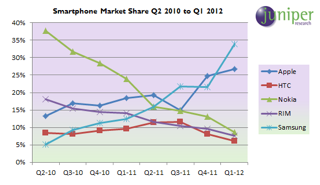 In Q1, Samsung is estimated to have shipped 46.9 million smartphones, compared to Apple’s 35.1 million iPhone devices. When considering revenues, however, the tables turn: Apple’s mobile revenues (which include the iPad) were $29.3 billion, while Samsung’s (which include all its mobile products, including feature phones) were just over half of that amount: $17 billion. And while Apple is beating Samsung in terms of pure revenue, it’s likely also to be beating Samsung in terms of profitability of those devices. When Apple reported another blockbuster quarter when it released its earnings last week, it noted that its gross margin had reached 47.4 percent. Samsung’s margin, on the other hand, was at 12.9 percent. Juniper, a UK-based research group, notes that although Apple and Samsung have “taken it in turns” to lead the market, it appears that Samsung has now established itself as the bigger player in volumes. The back-and-forth between the two also is a sign of their collective power at the moment: together, the pair snapped up nearly 60 percent of the whole smartphone market, which totaled 139 million units for the quarter. In Q4, the market share of Apple+Samsung was only 46 percent — which is a measure also of how rapidly others (most notably RIM and Nokia) have declined over that time. Unless Apple throws us a curve ball and launches another new device before the WWDC in June, it looks like Samsung will continue to remain in the lead for shipments in this quarter. That will be on the strength of its wide portfolio, covering a range of price points, as well as new launches. Case in point: it’s gearing up for the official launch of its newest Android powerhouse, the Galaxy SIII, later this week. The graphic above, depicting market shares for different mobile brands, tells a pretty stark story about what has happened to competitors as Apple and Samsung have gone up, but the game is far from over for the other players, notes Juniper analyst Daniel Ashdown. Yes, Nokia only shipped 11.9 million smartphones in the quarter — less than one-third of Apple’s number; the numbers for RIM, which reports on a different schedule, are not likely to be encouraging, either; and HTC has stopped giving out sales volumes altogether. But since Juniper believes the smartphone market will account for 1.1 billion devices shipped by 2017 — up from 600 million in 2012 — these players still have a shot to turn things around.